Get Plenty of Exercise and Sleep! The holidays can be an exciting time for cats and humans, but it's important to monitor your cats to see if they are getting enough exercise and sleep during this potentially stressful and tiring time. Most cats are indoor only and don't have the opportunities to run and play outside. It's important for the caregivers to provide activities for cat to help them maintain a healthy body weight and to keep muscles toned and strong. To assist cats with exercise and play indoors, you can set up areas where your cat and stretch, romp around, and climb. 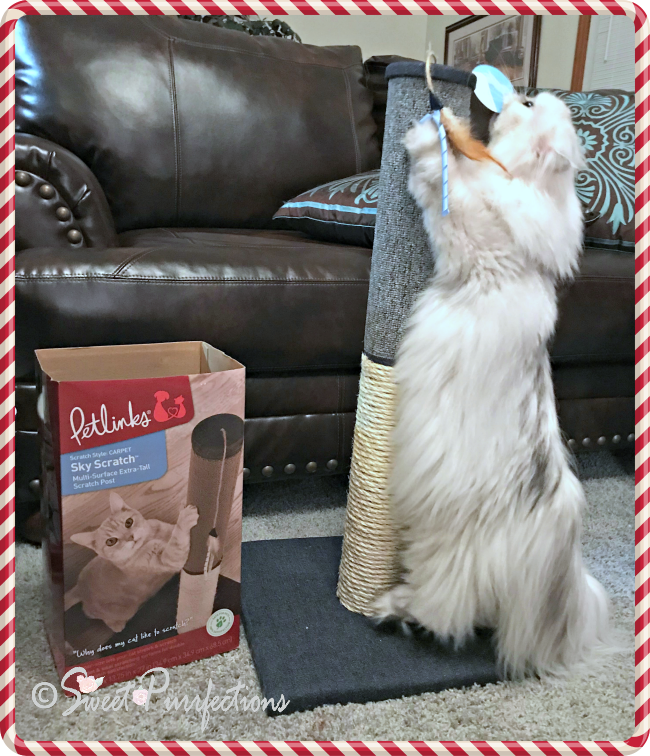 Cats need to stretch just like humans and giving them a tall scratching post like the Sky Scratch™ from Petlinks® can assist with this. Having plenty of scratching posts in the home helps prevent cats from scratching on the furniture and those special holiday items you display. Scratching helps cats stretch, tone muscles and even helps alleviate stress. The Petlinks® Sky Scratch™ features an extra tall and wide post with both carpet and sisal. The base is 13.8" x 13.8" and 27" tall. As you can see in the video above, the scratching post is sturdy as Truffle is playing with the dangling feather. Both girls love this scratching post and it blends in well with the household decor. The post base and core are made from recycled paper pulp. Did you know that cats sleep as much as 16 hours a day and can spend more time at rest (up to 20 hours) as they age? Cats tend to snooze about 75% of this time. Snoozing allows them to get the rest they need, but helps them to remain alert enough to wake up at a moment's notice. Deep sleep accounts for the remaining 25%. Cats need deep sleep to help their body regenerate itself and stay healthy. It's important to provide a secure, comfortable, and trusted location for your cat to sleep because they are most vulnerable during this time. Providing a comfortable pet bed, such as the Petlinks® Supreme Soother Pet Bed or the Soothing Escape Pet Bed may help your feline snuggle in for that needed nap. We received the Soothing Escape Pet Bed in the medium size for Truffle and Brulee to sample. This bed is a memory foam bed that can be used for dogs and cats. The Soothing Escape bed is a nest-style bed that is built with advanced, eco-sourced memory foam that conforms to your cat's body contours to support joints and relieve pressure points. The bed includes gel beads that keep your feline (or canine) cool throughout the day or night. The bolster sides are corduroy-lined. The zippered cover is removable for machine washing. This bed is available in two sizes: medium (24 x 23 x 6 inches) and large (32 x 31 x 8 inches). Another pet bed you may want to provide for your feline (or canine) is the Petlinks® Supreme Soother Pet Bed. This pet bed is also a bolster bed that is built from advanced, eco-sourced memory foam with gel beads for cooling. It has a small opening where pet can walk into the bed for an easier entrance. This bed is available in two sizes: medium (28 x 21 x 7 inches) and large (42 x 30 x 10 inches). 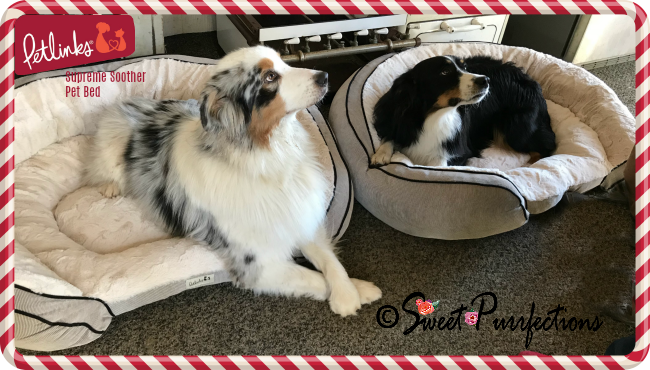 We received the large Supreme Soother pet bed to try out with our woofie cousins, Smokey and Angus, who are Australian Shepherds. Exercising, stretching, and relaxing are ways to help your furry children survive the hectic holiday season and beyond. Providing functional scratching posts and comfortable pet beds can enhance their experiences. Petlinks® products are designed to meet child safety standards and are backed by their 100% satisfaction guarantee. If a customer is dissatisfied with a Petlinks product for any reason, they will replace or refund it. Visit Petlinks on Facebook, Twitter, Instagram, or Pinterest. We're excited to announce that three of our readers have the opportunity to win a one of the above Petlinks® products. There will be one winner for the Sky Scratch, one winner for the Soothing Escape Pet Bed (M or L), and one winner for the Supreme Soother Pet Bed (M or L). No purchase necessary. The giveaway is open to residents of the United States 18+ years, except where prohibited by law. The giveaway will run from December 1-8, 2017, ending at 11:59pm ET. Three winners will be randomly selected by Rafflecopter (powered by Random.org) and notified via email. Winners will be based on their choice of the scratcher and pet beds. Winner will have 48 hours to claim their prize; failure to do so will result in forfeiture of the prize and a new winner will be randomly chosen. To qualify for the giveaway, a comment must be left on our blog post. Other entry options are available after a comment is left. Please check your email and be sure to add sweetpurrfections@sc.rr.com to your address book! Good luck! 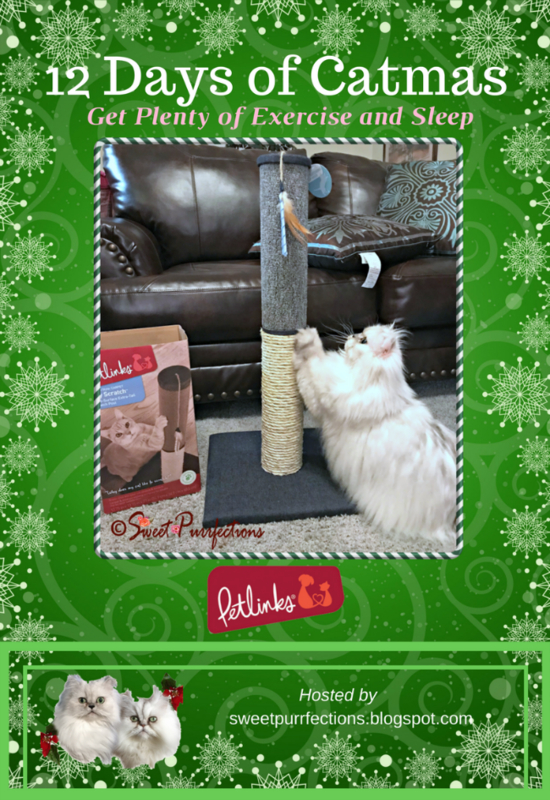 What a great giveaway - I love that scratcher. I'd want da scratcher - I LUV scratchers. We would most enjoy the Sky Scratch. Love that there are two different favorite types of scratching materials plus our scratchers have pretty much seen their day. My lazy cats would like to win the bed. Ooohhh!!! The scratcher is awesome. I love how it's the two different materials. Perfect for my two girls! As for beds... the animals around here wouldn't deign to sleep on a pet bed when they have our bed, the sofa, etc. :) but that Supreme bed looks pretty luxe! Oh those look great but Mom says we don't really need any of those things so will leave the excitement to others who can use them! I think all of our pets, both kitty and doggy species, would love one of those beds! Great giveaway! Such nice goodies, fun and comfy! That's a great giveaway. Good luck to all those who enter. I love that scratcher! Ellie would LOVE it. Beautiful modeling, girls! That scratcher for sure they LOVE to use posts! That scratcher looks pawsome but Mudpie loves snuggly beds too! My kitties would love the soothing escapes bed. We sure could use a new scratcher! The sisal rope around our lowest cat tree posts is wearing out. TBT says he will try to switch some posts. If he cant, he will re-wrap the posts. Oh joy, our Xmas presents might be 50 yards of sisal rope! Gee, with both dogs and cats at our house, we would love all three of the items here. I recently lost one of my dogs - my sweet girl Coonhound, Kyoko, and just put in an application to adopt another girl Coonhound. I've love the Supreme Soother Pet Bed in large for her. These are great items for pet owners! My cats would love a new scratching post! My cat is a former stray. Before we brought him into my house, he would fall asleep on my lap on the porch, but he was always on alert. I'm not sure he ever felt safe enough to go into a deep sleep. Now he can go into a deep sleep whenever he wants. I think he'd enjoy the supreme soother pet bed. You're right. We don't get nearly the exercise we should being indoors all the time. When we need to rest, though, we want sweet dreams and know we'll get them in either of the pet beds! ~ The supreme soother or the escape bed. Concats to the winner if it's not us and happy holidays, Truffle, Brulee and Paula! my cat would love that scratching post! definitely the scratching post!! even though the bed is adorable. i think i have more of an obsession with the beds than my cats do!!! they have a ton of beds and they use the couch and my bed!!! Thanks for the opportunity to win one of these. This is such a hard choice! On one hand even though I have plenty of scratching posts, I love that this one has both sisal AND carpet. I never saw one like this. OTOH, I only use my igloo these days but that southing escape bed sounds dreamy. I would be happy with either but am leaning toward the bed. I may change my mind. I'm a cat. Those are all great looking. My cat would love the scratcher, but the large supreme soother bed would be great for my dog. forgot to add why, they need a new bed to put in the new wooden bed that i got. this would be perfect to put in the wooden casing. My 2 cats would enjoy all the items. I'm sure they would want the beds over the scratcher, but we have a billion beds in our house. Though it would be nice to have another scratcher because my one cat really, really likes to scratch. So annoying. Especially, when they have huge cat towers. What great items! Webster would love the beds, and Paisley would love the scratcher--she is a real "reach up and stretch" kind of cat. my littl girl would love either of those beds! they look so cozy! My cat,Saphira, would love the scratcher. Saphira loves scratching posts and she hasn't had a new one in a while. My pup would love the Supreme Soother Pet Bed because it's roomy and comfy. I think Carmine and Lita would really enjoy the Sky Scratch. Lita, especially, because she loves vertical scratchers! My cat Camo would love the sky scratch the most. He needs something like this. My cats and dog would love the supreme soother bed! My dog really needs a bed since she has outgrown her old one. Oh my stars! What a fab giveaway. 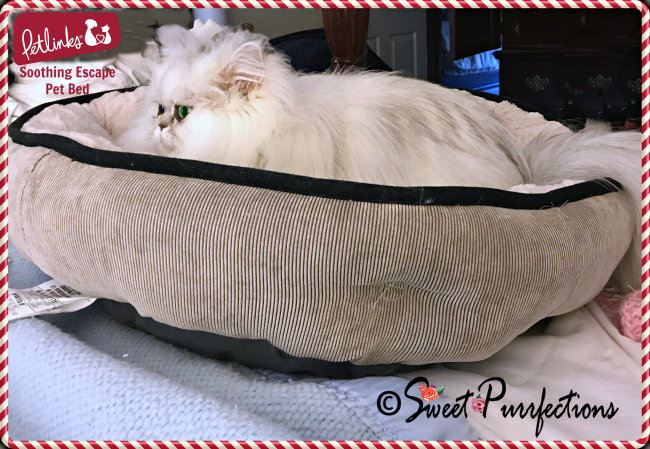 We would love the pet soothing bed to give to Will's cats for Catmus! I would like to get our still somewhat feral cat a bed so he will consider sleeping inside more. Not sure which bed to get, but the soothing escape bed looks good. I would love to win one of the beds for my dogs. Recently I realized that our current beds are a really past their usefulness, and Lilah in particular would probably like a soft bed with a bolster like the ones you're showing. Love your 12 Days of Catmas giveaways, BTW. Great products, creatively presented. My new kitty would love the scratching post, we are having a time keeping her from using the walls and couches. My cats would really like the Sky Scratch. They love scratching posts. One of my cats likes to tackle and kick them. They would love the Supreme Soother Pet Bed because they love to all pile up together and sleep. It's so adorable!! My cats would love the scratcher the best. They are always trying to scratch stuff they shouldn't! I saw my name on the day 1 winners list! I'm so excited thank you so much! How do I claim my prize?